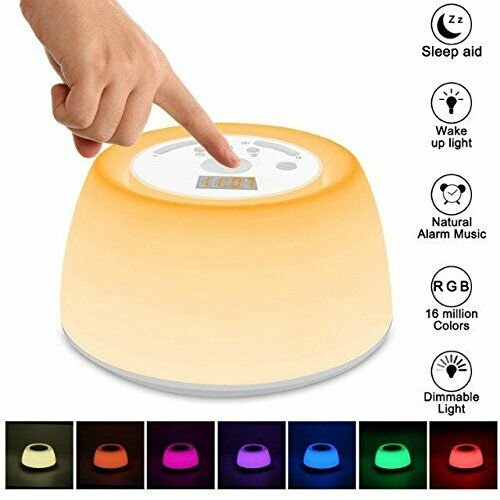 ·Sleep Aid：The soothing light is designed to produce red light wavelengths which can raise the secretion of Melatonin for helping you fall sleep and stay asleep. ·4 Natural Sounds：It can assists you in getting up pleasantly and comfortably. ·3-Level Dimmable: When it's in white light mode, you can set the brightness of the light for working. · 3600mAh rechargeable battery: It can last 160hrs maximumly in RGB multicolor mode.120hrs/10-11hrs/5-6hrs in white light mode at level 1/ level 2/ level 3 brightness respectively.